Well...after what seems to have been the longest wait of all time, I am finally going to write about a potential storm day. Its not looking great by any means but its a Saturday, I can chase, and there will be storms. Forget about GFS (for now...it'll probably jump on the bandwagon tomorrow afternoon after the fact). Its MesoLAPS that I like (and the BoM are obviously putting faith in it as that's what they are basing their forecast on). Ok - i'll stop blabbering and start typing. The upper trough that is sitting along the ranges of NSW (roughly) is set to pulse again tomorrow which will see the surface trough dig back inland but only as far as the ranges over NE NSW. SE'lys will dominate the rest of the east coast S of about Coffs - Grafton area. DP's should slip up around 18C (maybe higher but the source of the low level moisture is not the Coral Sea so not expecting 20's). Upper level temps should be around -12C or so and surface temps should creep into the high 20's and maybe even push 30C. Shear is ok. Not great in the lower levels with 5-10knt N to NE'ly at the surface. By 700mb, the air is dry and the winds are W'ly at 20-25ktns and at 500mb, the winds are WNW'ly at 35-40knts. The jet is sitting over the NE NSW region with 75knts or so. Its enough for storms to get organised for a bit and if something can get going, it should at least be photogenic. I'll check the models runs again tomorrow morning but I think I might be heading down to Casino (area). Interestingly enough, GFS has the trough sitting off the coast with -6 or so LI's off the coast (due to the upper trough pushing through earlier - but much stronger than MesoLAPS). I wouldn't be surprised to see the surface trough get dragged back inland and if the strong upper trough feature comes off, it could get really interesting. (GFS has -16C at 500mb over Grafton compared to the -12C of MesoLAPS). GFS also has much stronger shear with 25-30knts at 700mb and 50-55knts at 500mb. THe GFS scenario reminds me a little of March 30, 2003 (see here... http://www.australiasevereweather.com/storm_news/2003/docs/200303-01.htm ). For interests sake, if you load the recent 18z run of GFS and compare this to the charts at the bottom of the linked chase report from Michael Bath, you will see some distinct similarities. I'm not saying that its going to be anything like March 30, but it should at least give us something to look at. It has been a long long long time between "dry air aloft" storms here in SE QLD and NE NSW and I'll chase just about anything. Actually...i've just looked at it again and it looks very similar to March 30...hehe. But like I said, I'm not suggesting March 30 is going to happen. 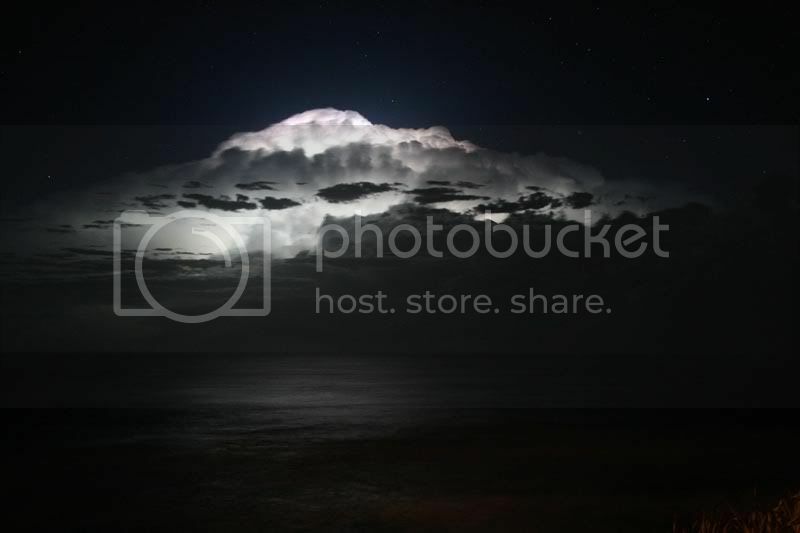 On a side note, there were some nice storms off the coast of SE QLD and NE NSW last night. I managed to get some photos (will put them up over the weekend) of a storm which was off the coast of Yamba (near Grafton) from my balcony here in Brisbane. 230km away. Quite impressive really - I even managed one half decent clear air CG which struck way way out the back of the storm. A nice little reprieve from months and months of cloud, rain and relatively boring weather in what is supposed to be our storm season. Had a storm pass through here around 2:30am. Woken up by a couple of gunshot flangs, but that was about it. According to the AWS only a kilometre or so from here we had 11mm but I wouldn't mind betting it was a little more than that, we had moderate to heavy rain for about 1/2 an hour. Gotta set up my rain gauge today hopefully that will be more indicative. Hoping for some more action this arvo, but will have to wait and see. Good to see such a massive response...hehe. Nah - j/k. Few things to note about today...well...yesterday for that matter. A nice supercell (confirmed by BoM) moved over the southern parts of SEQ yesterday. Bit of a surprise for most. Basically the trough drifted back inland dragging 20C+ DP's with it. Shear was pretty nice and it resulted in a fairly nicely sculpted supercell. Some damage was reported from the outer southern suburbs of Brisbane and the A-league soccer was delayed after the decaying storm moved over the stadium and flooded the pitch with 15mm in <10mins. There are some nice pics floating around http://www.geocities.com/artcrimez77/2.jpg (not mine). Now...on to today. Shear is nice right through NE NSW and SEQ. The problem is, although the trough sits very close to the coast through the whole area too, there is a dry push in the low levels (850mb) kicking in to NE NSW. This looks like it could write that area off (apart from a few hours this morning). There may be storms in that region given the strength of the upper trough but it looks like the better (deeper) moisture will be over SEQ. Not much else has changed from my previous post. When storms develop, they should be able to organise for a decent enough period of time to make them pretty photogenic. There is probably a window of opportunity for some marginally severe hail today given the cooler (than usual) upper temps and the shear. At a guess I'd say nothing bigger than 4cm but I'd be more than happy to be wrong and I'll be doing my best to prove that too...hehe. A few "hot spots" are likely to go up in SEQ today. The Border Ranges are an obvious one but the other one which has been firing nicely over the last few days is the area SW and W of Esk (Brisbane Valley into the lower Sunshine Coast Hinterland). I think either of those areas will fire today. Anyway - time will tell. Will keep you all posted as to what I do. Wasn't ignoring you or anything - saw your post yesterday but I was busy with other agendas so did not get a chance to check. All my chasing has had to be local given I burned out the latter part of the first part of the season. Nice scuplture alright but it seems it quickly became linear just having enough to survive before the outflow push. But any storm at the moment is a nice storm with great structure and contrast. I think it was briefly (half to one hour) a supercell and then I think it became undercut but it then mvoed into a multi cell phase and it managed to maintain that similar structure in the lower levels for quite a while - even right up to its demise. Its nice to finally see some "real" storms again. I was starting to wonder if this season was just going to whittle away to nothing and we were going to phase into a more autumn pattern of coastal showers and the odd thunder day. Perhaps not just yet. Ok - I'm out. Heading up to the Sunshine Coast. Going by the obs and winds, I think it might dry out a bit much over the SE corner of SE QLD. Few showers popping up already but I think the better show will be further N a little later on. Currently an isolated storm cell is slipping south of me and heading out to sea, very isolated and partially blocking out the sun. Going by the latest run of the models, activity is set to develop to the north and close to the coast, we just might have a chance today! Here in Sydney, from about the midday period, we had some darkening skies. The build up was in response to the cold pool passing over the Sydney region and heading towards the Hunter region as I type. We had thunder mostl from elevated cloud to cloud lightning activity for up to an hour but in frequent in most cases. The bulk of the heavy rain just passed to my south - perhaps half to one kilometre from my residence. Nevertheless, w did experience some moderate to heavy rain for about 15 minutes tapering off as time went on. The air now is quite cold as anticipated lagging behind the instability and thunderstorm activity. More cumulus developing to the south but I suspect mostly light showers is more than one would expect this afternoon or evening. The storm over north west Sydney was about 1 km to my north. I heard the occasional thunderclap emanating from the storm cell just to my north. I watched an interesting cumulus tower rise to my SE at the same time which then drifted northwards. I heard one thunderclap from that one as well but it quickly became a rain cell and outflow and the cell gradually weakened. It seems the first storm was centred on Kings Langley with 12 mm of rain falling, being the highest rainfall occurring in the region. Gyday all, just home from Ballina enjoying a rather active cell to the Se.It at times pulsing updrafts were very strong taking on a Nuke appearance with constant CC's and Ca's with occasional Cg's obscured by lower level stratu cu.The cell may have been riding the southerly change boundary.It was interesting to see the fast progression of the updrafts presenting a fairly high cape value. I also noticed at times an overshoot of the updraft maybe a sat infra might confirm this. 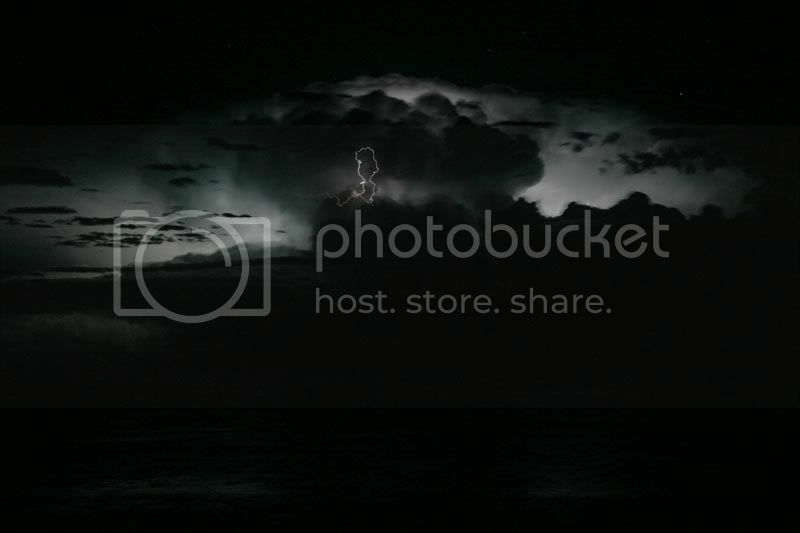 Bumped into Pato(Jason) while i was down there As per normal the best lightning happens while in transit getting there . 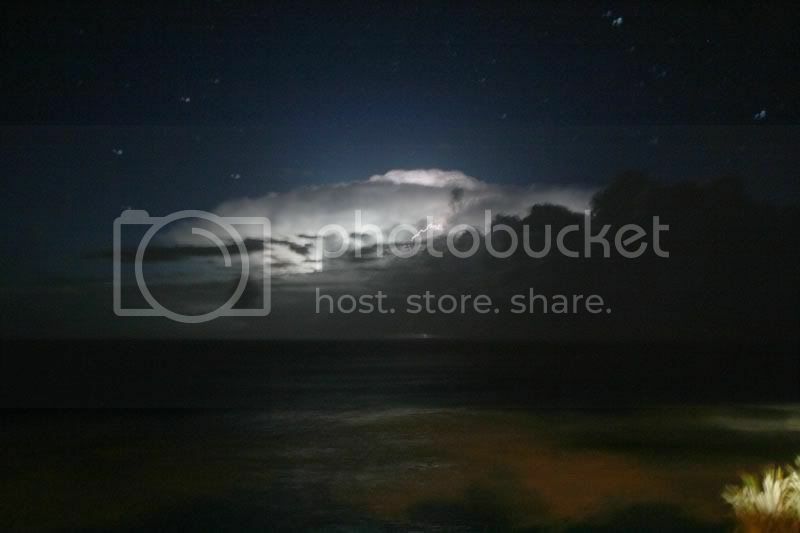 Well as Rod mentioned a very lightning active cell presented itself off the coast of Ballina. The lightning was absolutely constant and a fairly large crowd had gathered to watch natures beauty. The southerly finally put an end to proceedings, as it was quite vigorous and very hard to keep the tripod still. As Rod has already said the structure was very dynamic, with new updrafts constantly going up like a nuclear bomb. Must have tapped into some nice instability. Was a pleasant surprise after being denied much in the way of storm activity lately. Anyhow heres a few pics, hope you enjoy. I didn't want to start a new thread for last Tuesday as it really wasn't worth it so i've changed the dates on this thread to include the 12th. We had a nice area of convergence develop over Penrith which resulted in 25mm of rain to add to allready wet ground. I went out to observe the weak rain storm development ( I never heard thunder) and took some photos of interesting scud formations, differential motion as well as some very photogenic rain shafts. I was convinced by the structure that I would see some lightning but it never occured. I am glad you got that storm Jeff as it had interesting base motions! I was at school and no camera regardless. It was interesting for about 20 minutes and then lined out. Yes, Jeff I was expecting some lightning from the way Tuesday unfolded but nothing eventuated. 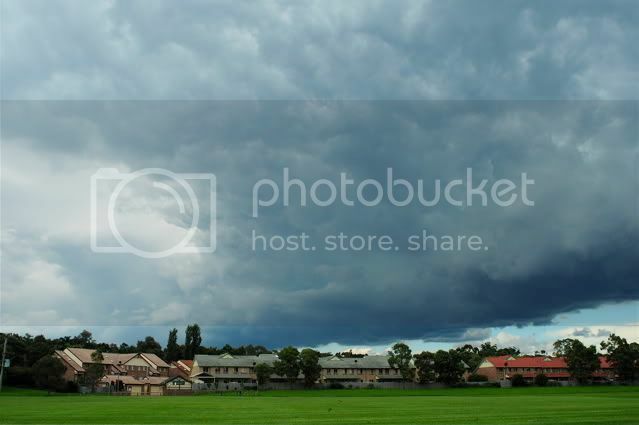 This photo was taken around 3.30 pm as the line went up to the NE of Parramatta . 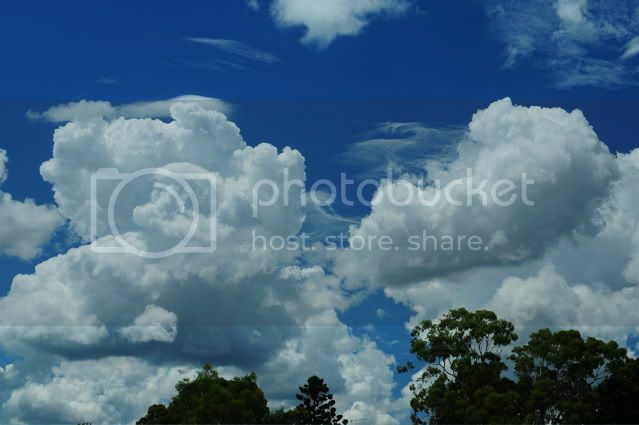 Earlier in the afternoon cumulus congestus with pileus were going up to the NE of Parramatta with some nice shear doing wonders to some cirrus. If Jimmy or Michael could supply the technical name for this cloud type that would be great.